MORE than 150 flights to and from Beijing have been cancelled or delayed as a thick cloud of acrid smog shrouded the city, with US figures saying the pollution was so bad it was off the scale. The national meteorological centre said the Chinese capital had been hit by thick fog that reduced visibility to as little as 200 metres in some parts of the city, while official data judged air quality to be "good". But the US embassy, which has its own pollution measuring system, said on its Twitter feed that the concentration of the smallest, most dangerous particles in the air was "beyond index" for most of the morning. The US system measures particles in the air of 2.5 micrometers or less, known as PM2.5, considered the most dangerous for people's health. Today's reading on its air quality index, which rates anything over 150 as unhealthy, over 200 as very unhealthy and over 300 as hazardous, breached the upper limit of 500, at which it stops giving figures. Meanwhile, the Beijing Environmental Bureau, which currently bases its air quality information on particles of 10 micrometres or larger, known as PM10, said the air quality in the capital was "good". A spokesman for the bureau would not comment when contacted by AFP. According to Beijing International Airport's website, 155 flights were delayed or cancelled today. Air France and Lufthansa flights coming from Paris and Tokyo respectively were among those grounded. The frequent discrepancy between US embassy readings and official data on pollution in Beijing has caused huge public anger as more and more residents worry about their health. In apparent response to public concern, authorities last week said they would start publishing hourly updates of the PM2.5 measure before the Lunar New Year starting on January 23, but those measurements have not yet begun. 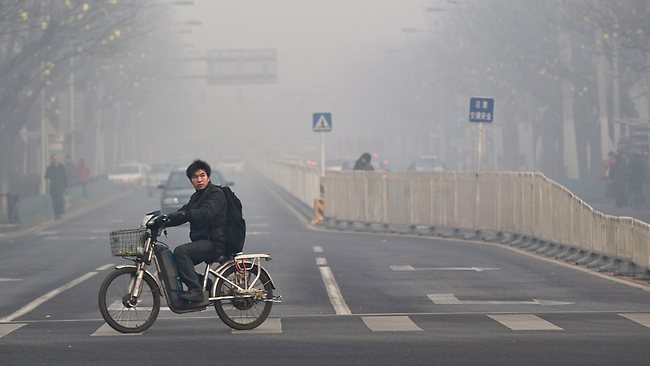 International organisations including the United Nations list Beijing as one of the most polluted cities in the world, mainly due to its growing energy consumption, much of which is still fuelled by coal, and car usage. Authorities in Beijing said last month they had met their target of "blue sky" days for 2011, with 274 days of "grade one or two" air quality compared with 252 days in 2010. But the state-run China Daily has said that if PM2.5 were used as China's main standard, only 20 per cent of Chinese cities would be rated as having satisfactory air quality, against the current 80 per cent.